It seems only moments ago that Rachel Evans (aka Motion Sickness of Time Travel) was just another name on the mile-long list of cassette artists releasing in batches of ten. That is of course until Digitalis re-issued her startling 'Seeping Through the Veil of the Unconscious' and the accolades started rolling in, one by one. 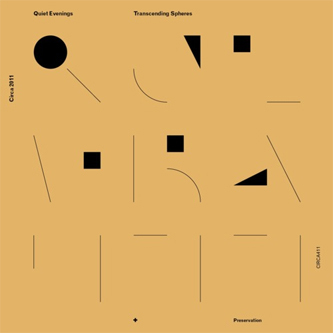 Quiet Evenings pairs Rachel up with hubby Grant, and finds them both exploring the kind of low-key electronic drones that have set the experimental world alight these last few years. 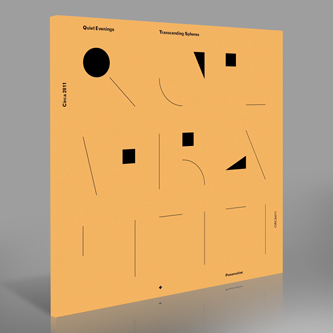 That's not to say that 'Transcending Spheres' is yet another attempt at nu-kosmische music though, there is something decidedly more modern about Rachel and Grant's subtle compositions. It might be the inclusion of the quietly intense beats that form the backdrop of each track, pulsing in the background incessantly eliciting comparison to Ezekiel Honig's techno-indebted compositions. These whisper-quiet rhythms are the perfect accompaniment for Rachel's signature haunted synthesizer drones, which bubble and wash through each track like a freshwater stream sparkling in the rich moonlight. It feels to me like there are so many hidden layers to these tracks it would be almost offensive to label it new age, still there is something to be said for getting a piece of music it would be a pleasure to drift off into a lucid state listening to. Gorgeous stuff.